The Fundamental 4s - free white paper! The Fundamental 4s is an easy to use model for designing extraordinary customer experiences in an exponential world. It’s a simple framework to design offerings that positively impact your customers to make them BE, DO, FEEL, and/or LOOK BETTER. The Fundamental 4s is used around the globe and has been presented as a tool at Singularity University, Google, Danske Bank, Lufthansa, and Bang & Olufsen amongst others. Sign up to get a free PDF copy of the eBook sent to your email! 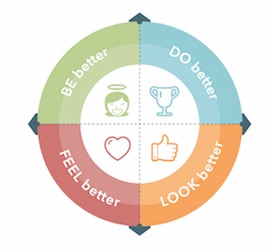 The fundamental 4s from @DARE2dk at #MaOf2015: Be better DO better, LOOK better, FEEL better. Good framework. Have an idea for a Fundamental 4s company? We’re looking for companies that make their customers BE, DO, FEEL and/or LOOK better! If you know an awesome example, let us know! We will review your recommendation and potentially include it as an example in future presentations, blogs, or in the updated version of The Fundamental 4s Book!